Size/Weight: medium/21 pounds, now, but will grow to 45 to 60 pounds. Training: Since Atlas has been here, he has been learning many new things. He has learned to sit, and is working on down and stay. He is learning how to jump into the bathtub to get his feet washed, because his foster family lives in Oregon, and it’s very wet here. He is learning “off” because sometimes he likes to jump up on people or look at what’s on the counter. Good with Children: Yes! He loves children and people in general. ALL people! He is extremely friendly, happy, and tolerant. Wonderful, warm personality. Good with Dogs: He is good with other dogs but should be introduced to new dogs slowly, one at a time, as sometimes he gets scared initially. He’s just a little guy, you know! Good with Cats: We have cats, chickens, and goats. He does fine with the other animals but needs to be introduced to each animal first so he knows what to expect. He is also not ever unsupervised, and the chickens and goats are in their own area separate from the dogs. Since he is a bird dog, he will need to be watched carefully around any chickens or water fowl that are kept as farm animals/pets, because as he grows, it’s likely his natural birding instincts will come out. House trained: In progress, but doing pretty well, so far! He is working on potty training. He's still little, and this is new to him, so he does have an occasional accident, and you have to watch if he starts sniffing... like you would for any puppy. He sleeps good at night, but usually needs to go potty once during the night. Crate trained: He does well in his crate. He is still learning the command to go in, but easily goes in with guidance. He will sometimes cry a little for a few minutes when he first goes to bed, but will quiet down quickly. Leash trained: Learning how to walk on a leash, but will need continued training. He’s doing well so far. Activity Level: Atlas is playful with a lot of energy! He likes to run and play outside, but mellows out pretty good once he’s inside. He would love to have someone who likes to cuddle and will take him outside to play. He especially likes one-on-one time. Atlas has been evaluated by Search and Rescue leaders and shows a natural inclination to do this. He was able to “naturally” complete a zig-zag search pattern the first time, where as it usually takes 2-3 months to teach a dog this. He is a fearless leader in the field and does well in town or in the mountains. Fence: Atlas will need a fence, or he will need to be on a lead or trained to an invisible fence if he is outside. Being a young dog, he will need lots of exercise so a fence is preferred unless a dedicated exercise plan is in place. Behavior: Atlas is smart, attentive, and loves to cuddle. He can also be easily distracted, so when you are working with him on his training, it’s best to do so where there are few interruptions, in a one-on-one situation. In this environment, he learns very quickly. He is learning a lot of puppy things, but hasn’t been training for very long. As far as puppy chewing, we provide him with toys and direct him to those if appropriate. Atlas is very independent and will be the guy out doing his own thing on the opposite side of the yard from where the pack goes. He’s out-going and curious. If he gets scared, he barks, so we are working with training him not to do this and helping him to feel more confident in unusual situations. Atlas needs someone who is willing to take the time to work with him and continue his puppy training and who will give him love and attention. He is looking for his person to bond to. He is like any other puppy who needs to learn basic commands and proper manners. He likes other dogs, but would probably do best in a home that didn’t have a lot of other dogs and where he can have one person in the family who is his dedicated person and is focused on him. When he bonds with that person, it will be forever! Medical History: Atlast is up to date on vaccines & microchipped. He is too young to be neutered. The adoption contract will state adopter must neuter by 9 mths of age. We will reimburse what "Friends of Animals" allow, which is $74.00. Atlas was found with his siblings on the streets of Greece where they had been left to the elements. He has been thoroughly vetted, and he has thrived since being rescued. Atlas originates from Greece where Leishmaniasis is endemic. He has tested negative, but Leishmaniasis can remain dormant in the system for many years, so their potential adopter must be willing to commit to having them tested annually for the next 7 years. Foster Comments: Atlas is a wonderful little guy. He is not aggressive and does well with people and animals, as long as he is introduced to the other animals so he isn’t frightened by them. He will need regular exercise, because English Setters need activity. He will need patience, like any puppy, but is very easily corrected. 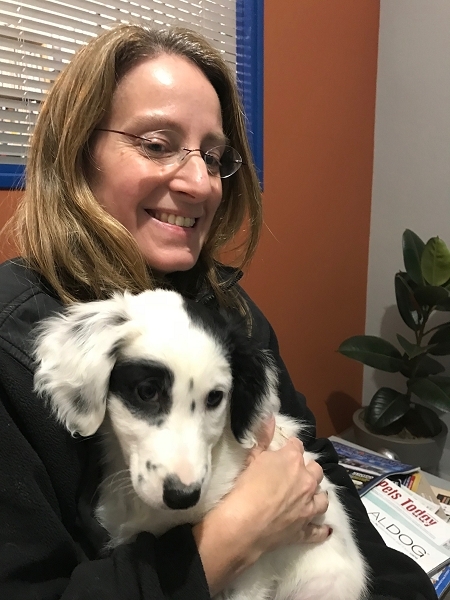 I would liken working with an English Setter puppy to working with a two-year-old. They need patience, supervision, and love. He would probably do well training for field trials, Search and Rescue, or agility. He has been tested and shows a HIGH APTITUDE for Search and Rescue and can already track naturally. Although English Setters need to be between 1 ½ to 2 years old before they start doing jumps because their bones are still forming, they can participate in non-jumping agility. He is a very sweet, happy, healthy puppy. Volunteer transport can be arranged in the Continental US within a 1,000 mile distance between adopters & foster home. Typically, we are able to transport your adopted dog to within 2 hours of your home. *Dogs can be adopted outside the 1000 mile transport distance; however, adopters must be willing to either fly their adopted dog, drive to a location within the 1000 mile transport range, or make independent transport arrangements for their adopted dog.